If all weekends concluded with a jungle retreat at the Keemala Phuket, Monday blues would be relegated to a distant memory. After an easy one-and-a-half-hour flight from Singapore and a 40-minute car ride later, I was immersed in a warm bath; in a tub perfectly carved from a single piece of rock that was smoothened to perfection on the inside; its water infused with the most divine fragrance. A circular shower area flanked by opulent curtains and punctuated by mosaic tribal art took centre stage in this otherwise rustic bathroom, while wrought iron chandeliers and mood lighting completed the cozy earthy ambience. I let my week’s urban weariness melt away. We were ready for a weekend of nesting at our Bird’s Nest Pool Villa at Keemala Phuket, a tranquil tropical forest retreat. Located on a forest hill at the edge of a village in the west coast of Phuket Island, the architecture and design concept set the scene for Keemala to stand out among a plethora of beach resorts. Several wooden bowl-shaped spaces, each impossibly suspended on a single tree trunk gave the impression of a collection of gigantic wine glasses placed carelessly on the lush slope. Linked by aero bridges, they housed the library, wine cellar, boutique and relaxation lounges. The matriarch of the Thai family that owns the property had lent her fingerprint (literally) to the resort which is reflected in its logo, while the architects and interior designers of Keemala have woven a tale of four fictitious clans of ancient Phuket into the design of the resort, giving rise to four distinct yet complementary villa types. The thatched Clay Pool Cottages are for the ‘Pe-ta-Pea’ clan and hints at their connection to earth. The Tent Pool Villas are for the ‘Khon-Jorn’ (merchants and traders) and have tarpaulins mimicking semi-permanent abodes. Tree Pool Houses are for the ‘We-Ha’ people (artists) and are whimsical bi-level bamboo pods that seem to be suspended from trees. 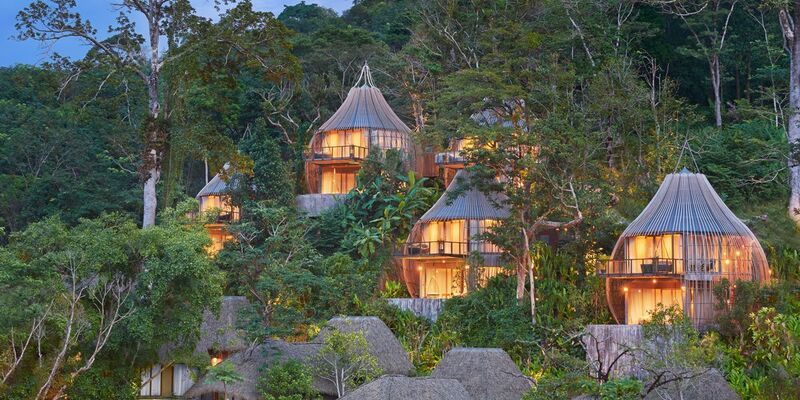 Woven Bird’s Nest Pool Villas, perched high up the hills, are for the opulent ‘Rung- Nok’ clan that lives in lofty treetops. Eco-consciousness and a commitment to sustainability extend throughout the property with its unique construction preserving the surrounding topography. They have a ‘no plastic bottle’ policy and boast a self-sufficient water system. The property even has rescued water buffalos and an extensive organic garden. We welcomed the rain during our stay. There was no better place to be “trapped” in than our 185sqm Bird’s Nest Pool Villa, an airy abode featuring a king bed cocooned in a net and wrought iron canopy. An infinity pool with views of the azure Andaman Sea beckoned morning laps straight out of bed. The earthy wood panels and dangling chandeliers were only interrupted by bold splashes of colour from a couple of ’80s retro-style chairs. The luxurious space included all mod cons, but it’s the incredible softness of the fabrics and the special blend of fragrance of the products provided that enveloped us in a mystical state of bliss. I breathed in the post-rain petrichor and lent my ear to the sounds of the forest. In this nest peace prevails. Dining at Keemala was a farm-to-table delight. We commenced the day with a super food breakfast smoothie bowl and energy boosting Thai concoctions of lemongrass, coconut and ginger. By midday we sipped Mojitos by the pool and proceeded to the restaurant for delectable Thai cuisine featuring herbs and vegetables organically grown in Keemala’s enchanted garden. Dinner was a wholesome fine dining experience with wine paired from a sizable wine list. Health and wellbeing is the heart and soul of Keemala, and an essential element of its Healthy Living Concept is a visit to the Spa. Built like a mini village sanctuary, therapy huts pepper the area, making for unique architecture. The spa offers massages, wellness consultations, holistic or traditional therapies by world-renowned visiting consultants as well as three-six day holistic living retreats. Our time at the Spa was spent in a magical state of zen as we indulged in a couples harmonising massage that was customised to relax, balance and harmonise the body and calm the mind. For the more energetic, Keemala has a fitness studio, jungle walkways, as well as paths for cycling and jogging. A little further afield, one can access scuba diving and yacht charters. Keemala has a policy against the mistreatment of animals by entertainment venues and does not arrange elephant rides and tiger shows. Instead, the resorts offers a variety of culturally enriching and outdoor recreational activities that do not exploit animals and offer an insight into the local way of life. Find out more at www.keemala.com or book through Mr & Mrs Smith for a Smith Extra 90-min Harmonising Massage for two at the spa.